Is there any tokusatsu robot characters more iconic to American audiences than Giant Robo? 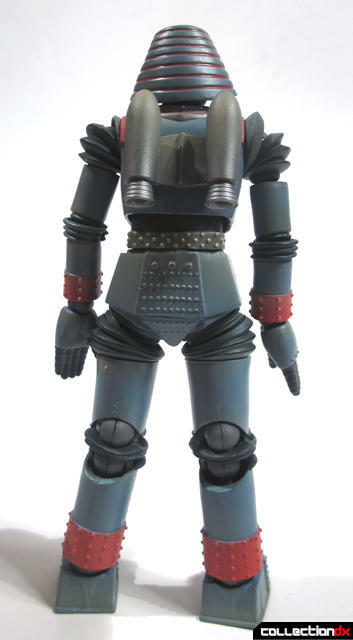 First airing in 1967 in Japan the 26 episode series was dubbed and aired on USA television as Johnny Sokko and his Flying Robot in the 1970’s. Growing up in Southern California during the late 70’s and early 80’s one could not help but to watch KTLA channel 5 and their fantastic programming. KTLA was an independent television station that broadcast some of the finest film “festivals” during weeknights and weekends. The program manager should get some kind of Emmy for all his hard work for putting together such “festivals” as “Disaster Week!”, “Kung Fu Week!”, “Giant Insect Week!” , “World at War Week!” “Bruce Lee Week!” or “Giant Monster week!” Every weekday night was filled with some of the finest domestic and international cinema a kid could ask for. I honestly think Quentin Tarantino was most influenced by KTLA than by anything else having grown up in Southern California around this time as well. Giant Robo, along with Ultra Man and Jet Jaguar, was one of those programs that I watched on weekdays and weekends on KTLA. 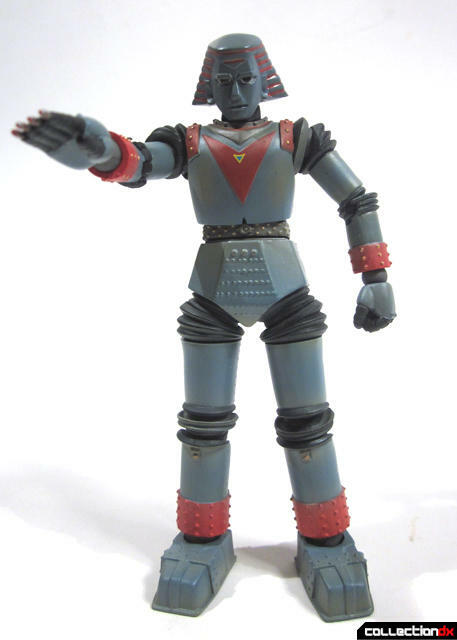 It was really one of my first memories of Japanese Sci-fi programs. 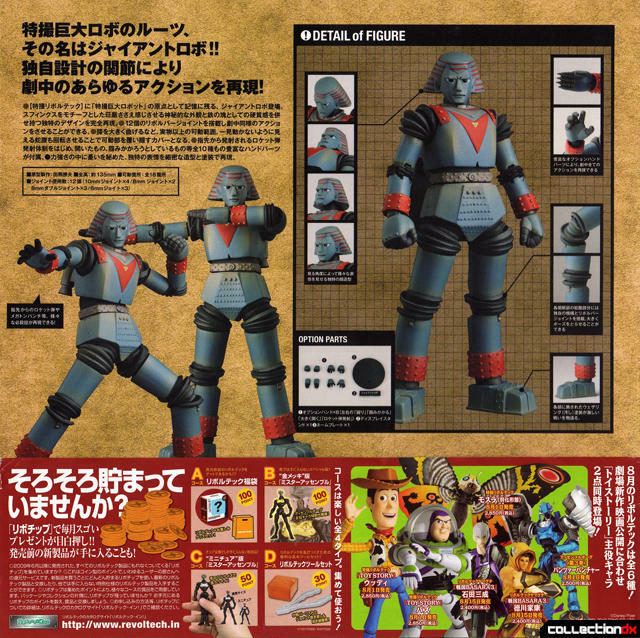 Giant Robo was also the best projection for a young lad such as myself to imagine myself as a kid operating Giant Rob. 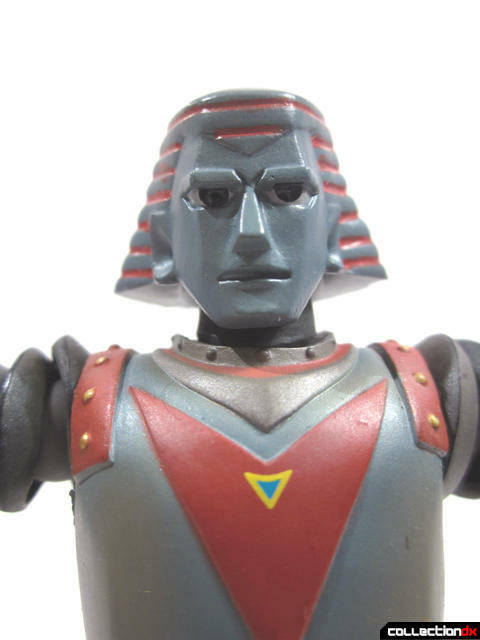 Giant Robo was somebody kids could believe in and were naturally drawn to his heroism and self-sacrifice. 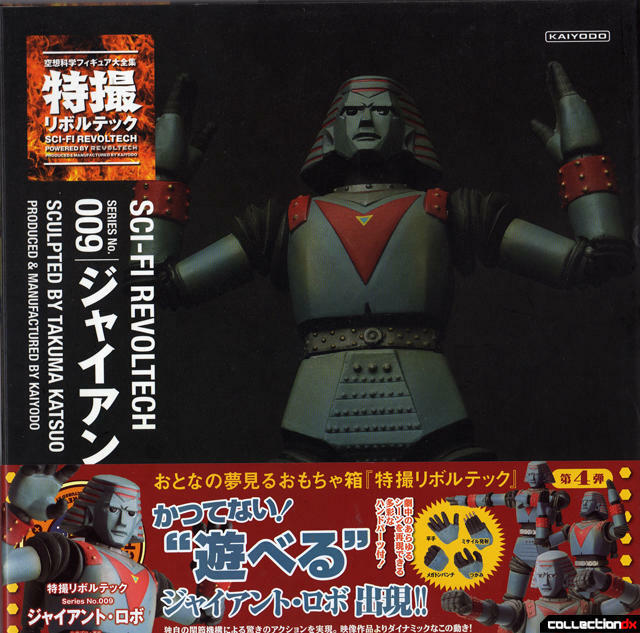 When CollectionDX received a review sample for Revoltech Sci-Fi’s Giant Robo, I jumped at the offer to do the review. Having long admired the Revoltech line from afar I found the Revoltech Giant Robo the best opportunity to not only review the figure but the line as well. I admire Revoltech as I feel it is the first time a Japanese company has really put a lot of effort into a quality small action figure line. Yes Takara has done Microman for years but they rarely if ever license the figure to an entire line of figures and I am sure there are other examples as well. I believe why Revoltech’s line has expanded as big as it has is because the line covers a market that has not really been covered by anybody else in Japan. And I do say “action figures.” It amazes me how many times adult collectors leave what kids think and do out of the toy collecting conversation. I have not one but two friends who have boys who are under 10 years old and they collect Revoltech toys. And when I am over their house they seem to play with their hi-brow poseable adult collectable like action figures. Action Figure has become such a naughty word with adult collectors and it is just denial on their part. I believe Revoltech is doing a great job with their new Sci-Fi series of figures. As I admired Revoltech from afar I never bought any of them because none of subjects chosen really appealed to my personal tastes. But the new Sci-Fi series, many which have recently been reviewed here on Collection DX, have been some of the coolest toys I have seen released in a long time. Every release scratches that itch for classic Tokusatsu and American Sci-Fi shows that in many instances have been left to languish in obscurity. Revoltech’s Giant Robo comes with: 1x Giant Robo, 1x Stand, 1x Coin, 1x Name stand, 4x sets of various extra fists, 1x plastic accessory case. 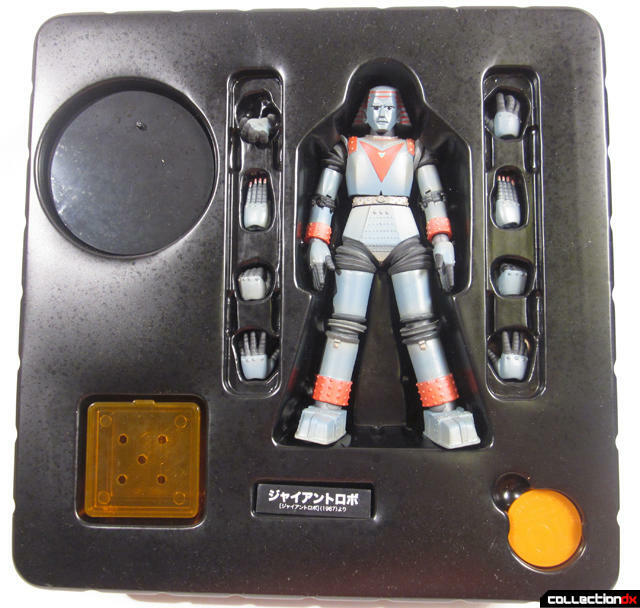 Giant Robo comes in a beautiful full color gatefold box which lid opens up and reveals Giant Robo in a vacuform tray. I had originally planned to take the figure out, take the photos right away and write up a quick review but when I pulled the figure out I was blown away with the beauty of the craftsmanship of Giant Robo and actually had to sit down and take in all the small details. The articulation seems not as dynamic as other Revoltech releases but neither was the original character. 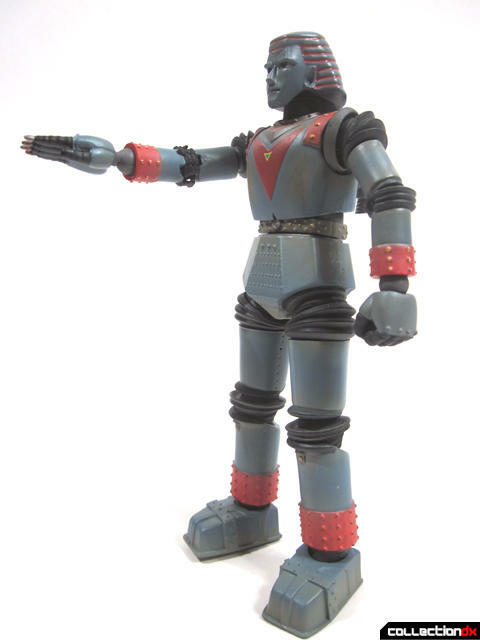 I am sure you can arrange Giant Robo in all its classic moves from the TV series but doing the classic Revoltech Crouch Thrust® might be a bit harder on this figure. 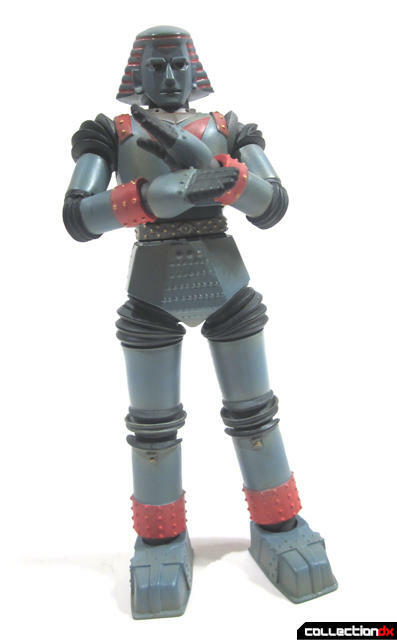 Unlike the other Sci-Fi releases, there are not many extra accessories that are included with Giant Robo. The exception is the most important and that is the 4 sets of extra hands, which include the famous missile fingers hand. I am more than satisfied with my first Revoltech release. 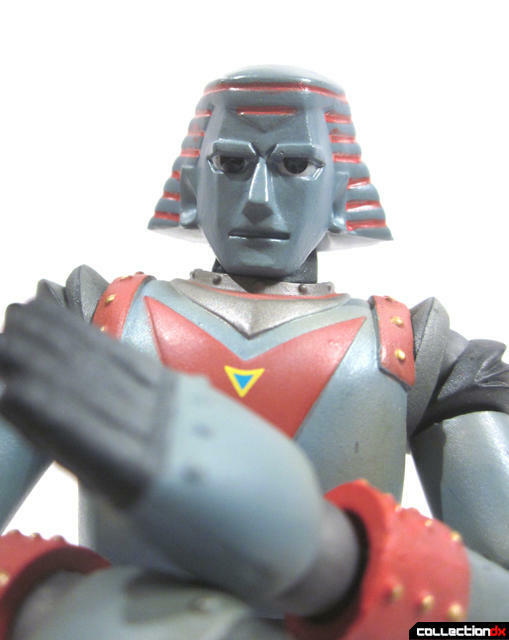 Giant Robo is an iconic figure that I can see many people who are my age and older who do not even collect toys pick one up just for pure sentimental reasons. 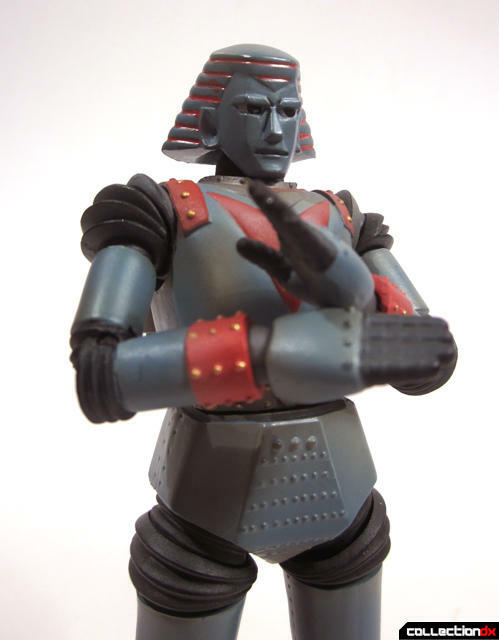 Like many of the Sci-fi Revoltech releases you will be pleasantly overwhelmed with craftsmanship of Giant Robo. Giant Robo, use your finger missiles!